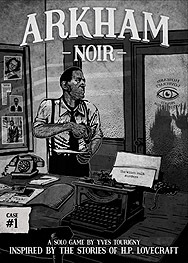 Arkham Noir is a solitaire card game inspired by the interconnected stories of HP Lovecraft and other authors. Each case stands alone. Gameplay consists of adding cards to open cases, creating lines of investigation, in an effort to solve them. The ultimate goal is to score five "puzzle" Clue cards in order to place together the Big picture, before running out of time or mental stability. Each newly shuffled deck is the start of a unique challenge, with adjustable difficulty levels to accommodate all level of players. In "the Witch Cult Murders", Howard Lovecraft investigates events based on the stories "The Dreams in the Witch House" (1933), "The Thing on the Doorstep" (1933), and "The Unnamable" (1923).